The Sunlight MiniOmni™ bone sonometer provides an exceptionally affordable, professional solution for early assessment of osteoporosis. 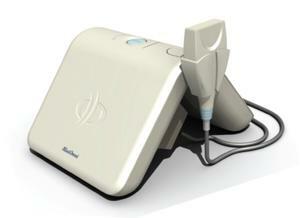 It enables reliable, accurate, non-invasive and safe monitoring of bone density – with exceptional cost-effectiveness. Its ultra-small size and weight (similar to and even lighter than a hardcover book), intuitive ease of use, and convenient USB-port connectivity to Windows 7 and above based PCs and laptops makes it ideal for use in any physician office or medical clinic, pharmacy, annual checkup center or other retail venue. technology that has been proven in thousands of Sunlight installations worldwide. Omnipath™ is a unique, patented, proprietary axial transmission technology based on the measurement of the speed of ultrasonic waves propagating alongthe bone. A breakthrough technology that is implemented in Sunlight Omnisense™ devices, Omnipath enables measurement along the bone’s maximal strength axis, eliminating soft tissue effects and providing better accuracy and precision of measurement. Axially transmitted speed of sound (SOS) indicates overall bone strength by reflecting properties such as mineral density, elasticity, cortical thickness and microstructure. The SOS measurement result is obtained after performing three consistent measurement cycles. Patented in USA and other countries. CPT Billing Code 76977 - Other Under Ultrasound Diagnostics. The REAL VALUE is your Cost Savings (current reimbursements are only $8 or $9 depending on the State, more relevant with Medicare). You can, in-house, easily identify Pre-Osteoporosis well before a fracture occurs. You avoid Transportation Costs, or Referring Off-Site (you save hundreds $200-$300). You avoid much higher costs such as related hospital stays, hip replacement surgeries (saves $ thousands). In addition, the Risk Assessment and Risk Adjustment benefits are huge. As you may know, when a Patient is diagnosed with Osteoporosis and prescribed accordingly, their Risk must be Adjusted, and at the same time, the Related Reimbursements. Classification of a “High Risk” Patient (similar to a Diabetic) adds related costs, thus added Reimbursements (revenue).